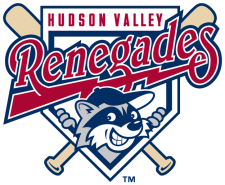 The Hudson Valley Renegades were on the losing end of a 13-9 slugfest against the Aberdeen Iron Birds on Saturday night at Dutchess Stadium. The two clubs combined for 22 runs on 25 hits and exchanged the lead several times in the game but when the dust settled, the Iron Birds were left on top. Aberdeen took the lead in the first inning. Trent Mummey singled to center to lead off the game. Omar Casamayor drove him home with a triple to right. Casamayor would later score on a ground ball by Michael Flacco to take a 2-0 lead. The Renegades battled back to tie the game in the home half of the first. Derek Dietrich, Diogenes Luis and Steve Tinoco all singled to load the bases. Burt Reynolds doubled home two runs to tie the game 2-2. The Iron Birds regained the lead in the third inning. Mummey homered to right to lead off the inning. Later in the inning, Jeremy Nowak doubled to left to score Casamayor and Kipp Shutz to give the Iron Birds a 5-2 lead. The Renegades added a run to their total in the bottom of the third. Tinoco drew a walk then scored on a line drive single by Nicholas Schwaner. The run pulled the Renegades to within two runs of the lead 5-3. Aberdeen struck for three more runs in the fourth. Mummey drove in two more runs to increase RBI count for the night, striking a two run double to right. Mummey would later score on a single by Casamayor to advance the lead to 8-3. But the Renegades battled back in the bottom of the fourth, striking for six runs to take the lead. Kyle Holloway drew a walk then advanced to second on a single by Mayobanex Acosta. Diogenes Luis singled to push across Holloway and move Acosta to second. Philip Wunderlich then drove home both runners with a double to center. Tinoco followed with a walk. Schwaner then cleared the bases with a three run homer, his second of the year to give the Renegades an 9-8 lead. But the lead would not last long as the Iron Birds scored twice in the fifth to take the lead back. Joe Oliveira drew a walk then advanced to third on a double by Austin Rauch. Michael Rooney drove home the tying run with a ground ball to short. Casamayor then drove home the go ahead run with a sac bunt to score Rauch and give them 10-9 lead. The Iron Birds picked up three insurance runs in the ninth. Adam Gaylord doubled to right. Nowak laid down a bunt to pit runners on the corners. Oliveira then drew an intentional walk to load the bases. Rauch drove home the first run with a sac fly. Then it was a single by Rooney to push across two more runs to give them the 13-9 margin of victory. Devin Fuller pitched 3 1/3 innings and allowed 8 runs on 10 hits with 3 strikeouts and a walk. Kevin Chavez suffered the loss, allowing 2 runs on 1 hit with a strikeout and 2 walks in an inning pitched. Robert Dickmann threw 3 1/3 scoreless innings with a hit, 2 strikeouts and walk. Steve Hiscock pitched the final 1 1/3 innings with 3 runs on 2 hits with a strikeout and a walk. The Renegades (6-9) head to Medlar Field for a three game series against the State College Spikes (9-7). Nate Garcia (1-0, 2.70) will get the start for Hudson Valley against Zack Dodson (0-0, 5.91) for State College.